Championship promotion hopefuls Brighton maintained their fine away record this season with a goalless draw at play-off hopefuls Preston. In the fourth successive 0-0 draw between these two sides, North End went closest to a goal when Calum Woods volleyed against the bar. But Brighton twice had the ball in the home net, each time denied for offside. Brighton stay fourth, four points off top spot, while Preston remain 10th, six points shy of a play-off place. Chris Hughton's Seagulls have only lost two of their 18 Championship away games this season, of which they have now drawn 11. Preston maintained their record of never having lost a home game to Brighton in 15 visits by the Seagulls to Deepdale. Jamie Murphy was the first to be denied by the linesman's flag in first-half injury time from Dale Stephens' free-kick - and the same happened to Tomer Hemed after home keeper Chris Kirkland had spilt Murphy's low drive. Apart form that, Woods' left-foot angled volley, which bounced down off the bar, and Sam Baldock's right-foot shot just wide at the other end were the closest either side came until Preston's Murphy glanced a late near-post header just wide. The previous three meetings between these two sides - the October meeting at the Amex and both games in the 2005-6 season - also ended 0-0. The last player to score in this fixture was David Nugent, who got North End's third goal in a 3-0 Championship win in April 2005. Preston boss Simon Grayson: "They are a very strong team but off the ball we did very well. The shape was very good and defensively we limited them to few opportunities. "Second half I thought we were the better team, so I'm disappointed we haven't won it, but two clean sheets against Brighton is a big ask from the players. "We've got a number of games left now and we'll just keep approaching it as we have over the last few weeks. We want the players to go out and express themselves." 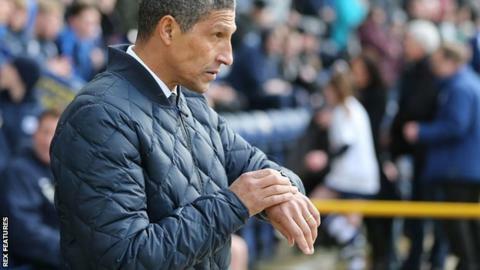 Brighton manager Chris Hughton: "We had a couple of good chances and so did they. On the balance of play I thought we threatened but we didn't retain possession well enough in the areas we needed to. "They worked very hard and restricted the quality balls we were able to put in. Away from home if you can't play as well as you'd like you've got to make sure not to lose the game. "Defensively, we were solid again. As a back four we had a fair bit to deal with. "The only disappointment is that we didn't keep possession well enough and if you don't do that then you make life harder for yourself." Match ends, Preston North End 0, Brighton and Hove Albion 0. Second Half ends, Preston North End 0, Brighton and Hove Albion 0. Corner, Brighton and Hove Albion. Conceded by Tom Clarke. Attempt missed. James Wilson (Brighton and Hove Albion) right footed shot from the centre of the box misses to the left. Assisted by Jamie Murphy with a cross. Substitution, Preston North End. Jordan Hugill replaces Daniel Johnson. Substitution, Brighton and Hove Albion. Steve Sidwell replaces Tomer Hemed. Foul by Tomer Hemed (Brighton and Hove Albion). Substitution, Preston North End. Eoin Doyle replaces Joe Garner. Offside, Brighton and Hove Albion. Liam Rosenior tries a through ball, but Tomer Hemed is caught offside. Attempt saved. Liam Rosenior (Brighton and Hove Albion) right footed shot from outside the box is saved in the bottom right corner. Attempt blocked. James Wilson (Brighton and Hove Albion) left footed shot from outside the box is blocked. Assisted by Bruno. Attempt missed. Bailey Wright (Preston North End) right footed shot from outside the box is high and wide to the right following a set piece situation. Delay in match Connor Goldson (Brighton and Hove Albion) because of an injury. Substitution, Preston North End. Callum Robinson replaces Greg Cunningham. Delay in match Paul Gallagher (Preston North End) because of an injury. Beram Kayal (Brighton and Hove Albion) is shown the yellow card for a bad foul. Paul Gallagher (Preston North End) wins a free kick in the defensive half. Attempt blocked. Greg Cunningham (Preston North End) left footed shot from the left side of the box is blocked. Assisted by Paul Gallagher. Corner, Preston North End. Conceded by Bruno. Attempt missed. Paul Gallagher (Preston North End) right footed shot from outside the box is high and wide to the left. Attempt missed. Joe Garner (Preston North End) header from the centre of the box misses to the right. Assisted by Calum Woods with a cross. Attempt missed. Tomer Hemed (Brighton and Hove Albion) right footed shot from the centre of the box is too high. Assisted by Bruno with a cross. Substitution, Brighton and Hove Albion. James Wilson replaces Sam Baldock. Offside, Preston North End. Joe Garner tries a through ball, but Adam Reach is caught offside. Attempt blocked. Adam Reach (Preston North End) left footed shot from the right side of the box is blocked. Corner, Preston North End. Conceded by Dale Stephens. Attempt blocked. Greg Cunningham (Preston North End) left footed shot from outside the box is blocked. Assisted by Bailey Wright. Attempt missed. Sam Baldock (Brighton and Hove Albion) right footed shot from outside the box misses to the right. Assisted by Beram Kayal. Corner, Brighton and Hove Albion. Conceded by Chris Kirkland.